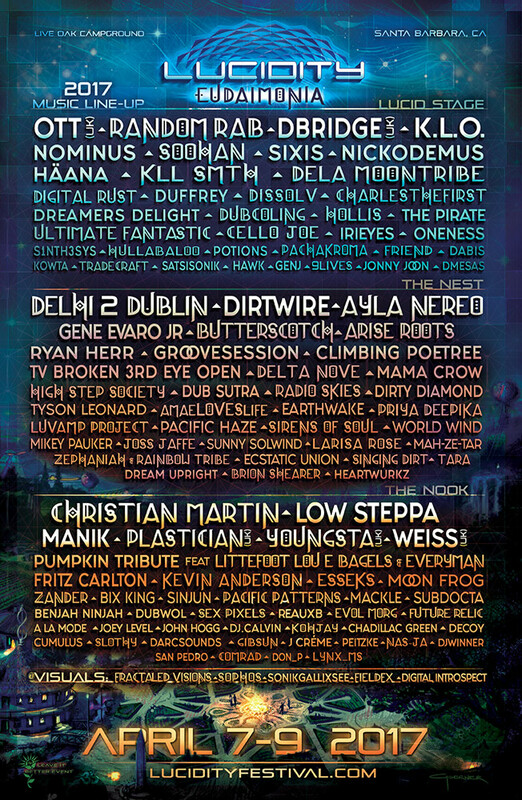 Lucidity Festival, which runs from April 7-9th, 2017, will be the temporary home to over 120 different musicians, DJs, performers and stage designers. With a deep lineup, audiences are sure to find something that suits their taste as well as new artists to discover. Since its inception in 2012, the producers of the event have worked to create space for both established and experimental artists and collaborations. While there is a wide range of genres and styles featured, the common thread is artists with a positive message. Lucidity will feature three distinct musical environments: The Lucid Stage, The Nest and The Nook. Each area features a unique stage design, immersive lighting and interactive art. The Lucid Stage functions as the thriving heartbeat of the event. The stage will feature two legendary British producers: Ott will bring his psychedelic Dub and Drum-N-Bass experimentalist Dbridge will also play. Random Rab, who headlined Lucidity in its first year, will return with his blend of lyrical symphonies. Plenty of highlights can be found in acts ranging from Kll Smth’s breakbeats and grimey Buddha Bass from Dela Moontribe. SOOHAN, a rising star from Baltimore, will headline the festival’s pre-party in Santa Barbara, February 24th, in addition to playing the Lucid Stage in April. Strings and samplers will take the stage in two separate acts: HÄANA, who plays the violin, and festival-favorite Cello Joe. A sponsor of the event, Keyframe-Entertainment is representing Dissolv, who will also be performing at the main Lucid Stage. Dissolv's latest accomplishments include the Tribal Bass remix of IAMEVE's "Starman", their "Water Warrior" track on Aquatic Collective's Standing Rock benefit compilation, and remix to Wildlight's "Lantern." The Nest, cuddled in the Lover’s Nest, has become the go-to zone for live, intimate and lyric-driven music. Some highlights include self-described Americana/Swamptronica trio Dirtwire and singer-songwriter Ayla Nereo, who will be supporting her new album, The Code of the Flowers. In 2017, the Lover’s Nest will expand its stage size in order to accommodate larger ensembles such as the aforementioned Banghra-Fusion group Delhi 2 Dublin, TV Broken Third Eye Open, and the hard-working collective Earthwake. 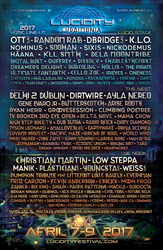 Lastly, The Nook stage, housed in the Nomad’s Nook, is hosting a funky, wild and high-energy corner with many established and up-and-coming talent loosely affiliated with Techno, House, and other danceable genres. Headlining The Nook will be Dirtybird DJ and techno magnate Christian Martin. British dance music will be well-represented with the smooth synths of House DJ Low Steppa, as well as sets by Plastician, Youngsta and Weiss. The Nook will also feature the second annual Pumpkin Tribute, where Littlefoot, Lou E Bagels and Everyman will help remember the remix maven. Nestled in the Santa Ynez Mountains, amplified music at Lucidity runs until midnight to allow families to rest, meet sound ordinance requirements, and to allow participants to practice their dreaming. Past midnight, the seven villages on the festival grounds host numerous performances throughout the night, planned and spontaneous. These often continue all the way through sunrise, when hundreds of workshops, yoga classes, meditation zones and flow arts start anew. Prior to the festival, Lucidity will also host its Lucid University Courseweek from April 3 - 5. This year’s Courseweek curriculum includes Dream Council, Regenerative Community Building, Ayurvedic Herbalism, Creating Your Personal Mythology, Ecstatic Flow Arts, and Building with Bamboo. Hosted by experts, the dynamic courses are designed to offer immersive educational experiences, resulting in LU Certifications of Completion. Executive Produced by Keyframe and Associate Produced by Lucidity, the “ReInhabiting the Village” book and community project will also be featured at the event. The 352-page book features twelve themes: Heart of Community, Health and Healing, Art and Culture, Learning and Education, Regional Resilience, Inhabiting the Urban Village, Community Land Projects, Holistic Event Production, Living Economy, Media & Storytelling, Appropriate Technology, and Whole Systems Design. Featuring 60 selected contributing authors, and showcasing the work of 14 Visionary Artists, the book offers an array of perspectives and resources that are useful to communities worldwide. For more info and tickets, go to http://2017.lucidityfestival.com/.